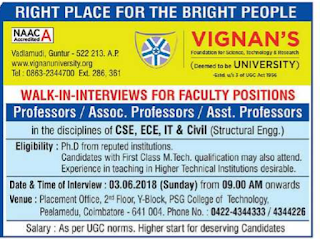 Vignan's University, Guntur has advertised in THE HINDU newspaper for recruitment of Professor, Associate Professor, Assistant Professor jobs vacancies. 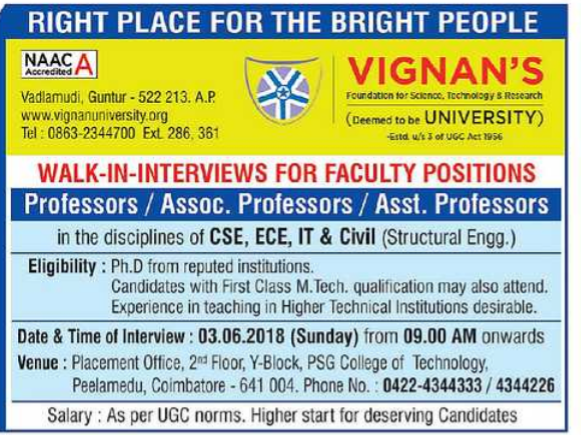 Interested and eligible job aspirants are requested to interview on 03.06.2018.Check out further more details below. Vignan Foundation For Science, Technology and Research (VFSTR) has made it, as its mission to prepare globally acceptable readily deployable, industry ready skilled professional and navigate towards the socio-economic transformation of the region. It provides quality education in a diverse and intellectually stimulating environment. It imparts value addition training to students to make them competent and inspired engineers. The institute celebrate the power of knowledge, cultivates vision and build awareness about the self and society around. Rice experience in teaching in Higher educational institutions desirable. High start for deserving candidates. How to apply: Interested and eligible candidates can attend date and time interview:03.06.2018 from 9 am onwards.